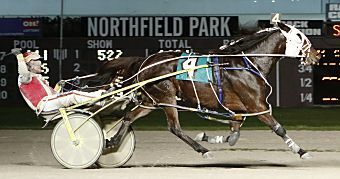 Northfield, OH — Aaron Merriman became the first driver in the history of harness racing to achieve multiple 1,000-win seasons when he scored in the 12th race on Saturday (Nov. 24) at Northfield Park. The triumph was a gate-to-wire victory aboard Zumba in 1:57.3 over a sloppy surface. Aaron Merriman becomes the first driver to win 1,000 races in consecutive seasons. JJ Zamaiko photo. Harness racing fans have been counting down Merriman’s victories all over social media, tracking the well-traveled reinsman across the Midwest at racetracks near Cleveland, Ohio, Pittsburgh, Pennsylvania, and Dayton, Ohio. Merriman raised his whip with elation as he crossed the wire to celebrate his historic achievement. Last year Merriman became only the fourth driver in harness racing history to score 1,000 wins in a single year, posting a total of 1,095 victories. It took him only a year to become the first ever to repeat that feat.